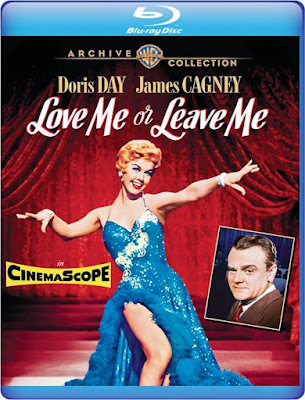 Rupert Pupkin Speaks: Warner Archive - LOVE ME OR LEAVE ME on Blu-ray ""
What is it about Doris Day that is so magnetic? She's lovely, a fine actress and a delightful singer. But more than that, she has this certain ferocity about her. In this movie especially, she emits the vibrations of a strong, independent woman. When we first see here character Ruthie in this film, she's working as a dance hall girl. We see her getting pawed by one of the patrons and then we see the aftermath of her giving him a good kick to let him know to knock it off. Of course this gets her fired, but she doesn't care. She's rather be unemployed than subject herself to that kind of abuse. Her little scene catches the eye of a hoodlum laundry business entrepreneur named Marty Snyder (James Cagney). Marty immediate responds to her spunkiness and tries for what he thinks will be an easy conquest. But the specific qualities he responded to are exactly what he gets in kind from her when he tries his come-on. Instead of being turned off, Marty becomes more enamored of Ruthie. He sets her up with nightclub jobs until she pushes for a singing gig and he gets her a headliner spot. She's a good singer, so things go well. She knows what Marty's angle is, but she figures that if she's up front with him then he can't hold her accountable to return any favors he's done. She's got one problem though. Marty is "stuck" on her. She's not stuck on him though. She has eyes for a piano player (Cameron Mitchell) who has been accompanying her and who also has an thing for her. He is even trying to get her to break free from using Marty to get ahead. Ruthie can't do it though. She still needs Marty's help and is also leading him on. Can you see where this kind of lopsided love triangle might be problematic? 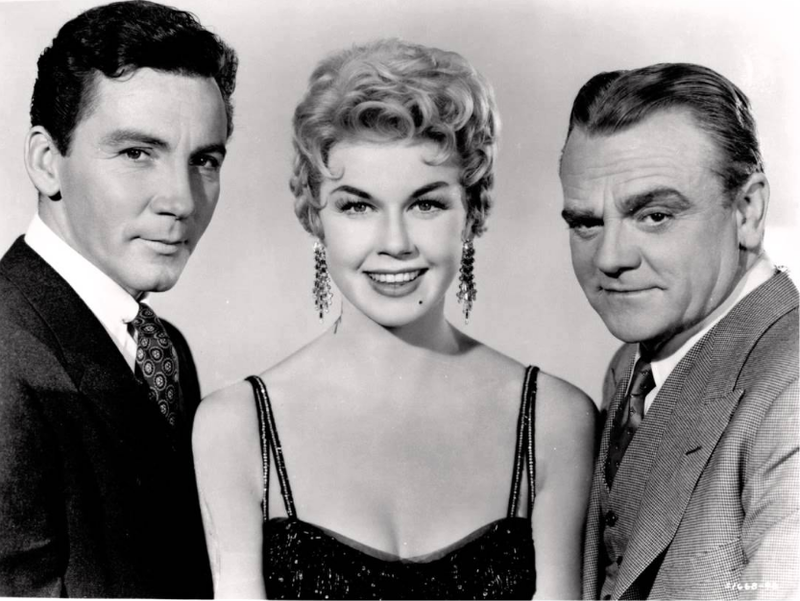 Well it is and this musical skews darker than anything you'd expect from Doris Day during her Rock Hudson comedy years. She's good with drama though. It's a great and sympathetic role for Cagney too. And it's got lots of nice Doris Day singing numbers and is shot in CinemaScope. These are all good things. When I first heard of this film it was via the great Martin Scorsese. He was speaking about his film NEW YORK, NEW YORK and was calling out a few things that he counted as influences on it. Now, if you haven't seen NEW YORK, NEW YORK, you really should. It's far better than it's sometimes shoddy reputation would have you believe. It's a dark musical. Who could be surprised by this considering it's Scorses though. So when he talked about the films that inspired it, it makes sense that he would call out musicals that weren't all puppies and rainbows. He mentioned one called BLUE SKIES and also LOVE ME OR LEAVE ME. I don't know about you, but for me, the Scorsese stamp of approval goes a long way and has rarely disappointed me with the films he's called out being a fan of. If the cast and story don't get you, watch it for Marty - he won't let you down. -3 Vintage Shorts, the First Two with Ruth Etting: A MODERN CINDERELLA, ROSELAND and A SALUTE TO THE THEATRES.